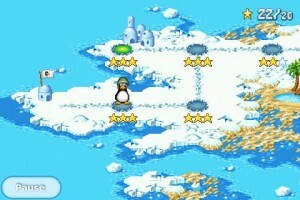 App Review: Crazy Penguin Catapult by Digital Chocolate, Inc. When we read the name of this app, Crazy Penguin Catapult, we were a little skeptical. Was this going to be a silly app that gives you a quick laugh and then you forget about it? We decided to give it a try anyway and were pleasantly surprised. Yes, the idea of catapulting penguins is still kinda silly, but it works. When you launch the game, it shows you a quick video of polar bears taking some penguins prisoner. The object of the game then is for you and your fellow penguins to save the other penguins. You are then introduced to the map from which you enter the first level. Each level begins with the catapulting of the penguins. The penguins swing from a rope over the catapult in a cave. When you think the trajectory is correct, you tap the screen releasing the catapult. The catapult sends the penguins flying. Don’t release the catapult at the wrong moment or the penguins will go splat on the ceiling or walls of the cave in a cartoonish sort of way. Once all of the penguins have been catapulted out of the cave, you move on to the second phase of the level. 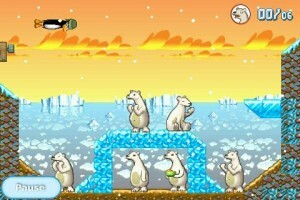 On this screen you try to hit the polar bears with your remaining brave penguins. The penguins fly across the top of the screen. With one quick tap on the screen, they take a nose dive toward the polar bears below. The number of polar bears that you hit determines whether you complete the level or not and how many stars you get for the level (1-3). If you don’t get a perfect score, you can always go back and try again. As you complete a level, you are returned to the map and the path to the next level opens up. There are even bonus levels that appear as you progress through the map. It did not take us long to complete the first map, although successfully using the catapult on a few of the levels proved a real challenge. If you are looking for a game that will keep you occupied for awhile, this may not be the one for you. However, if you are looking for a fun way to kill some time, enjoy. 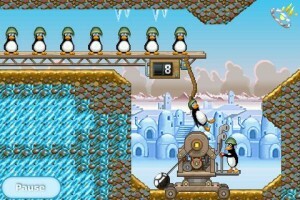 Crazy Penguin Catapult is $4.99 in the iTunes App Store. A smaller version of the game, Crazy Penguin Catapult Lite, is free in the iTunes App Store.